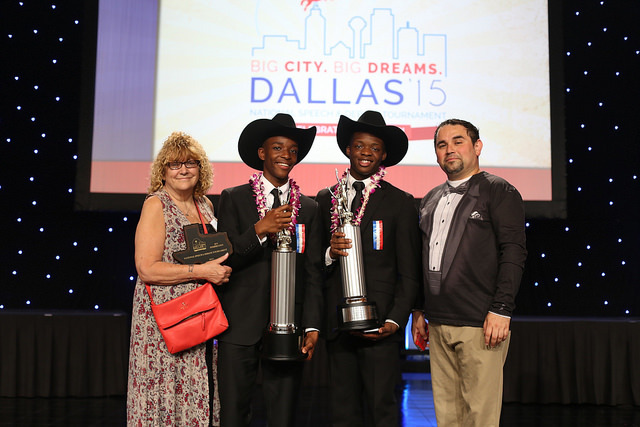 Outfitted with cowboy hats, giant trophies, and a plaque in the shape of Texas, Bronx Prep scholars, Stephen D. and Tavan T. were named as the first place winners of the Duo Interpretation competition at The National Speech & Debate Tournament in Dallas, Texas on Friday, June 19. Stephan and Tavan competed in 12 rounds over three days before making it to the final round on Thursday night. The two were the youngest competitors and the only non-seniors in the final round of the competition. They were each awarded a $1,000 scholarship, and guaranteed a spot in next year’s competition. Bronx Prep High School’s Speech and Debate team, coached by Sarah Rosenberg and Luis Cardenas, won a School of Excellence Award, which recognizes the accomplishments of all seven of the school’s competitors. The National Speech & Debate Tournament is the world’s largest academic competition, with more than 5,000 student competitors.